Dr Michael Spacie was given piano lessons by his parents commencing on his tenth birthday. He successfully progressed through the Associated Board of the Royal Schools of Music practical and theory of music grades, achieving by 18 years of age, Grade 8 in both piano practical and theory of music whilst under the tutelage of Sybil Pentith GRSM, LRAM. Image: Professional – a mature tutor (middle-aged) – highly qualified and well experienced with proven results for all to see and almost 30 years of teaching experience. Branding: Exactly the same as the current website i.e. reds and cream pages. Verdana is a possible font option although a similar more modern option might work better. Logo: A new logo will be required. This will be a text logo with a simple graphic. This will follow the brand colour guide lines. A circle with initials followed by text is preferred. 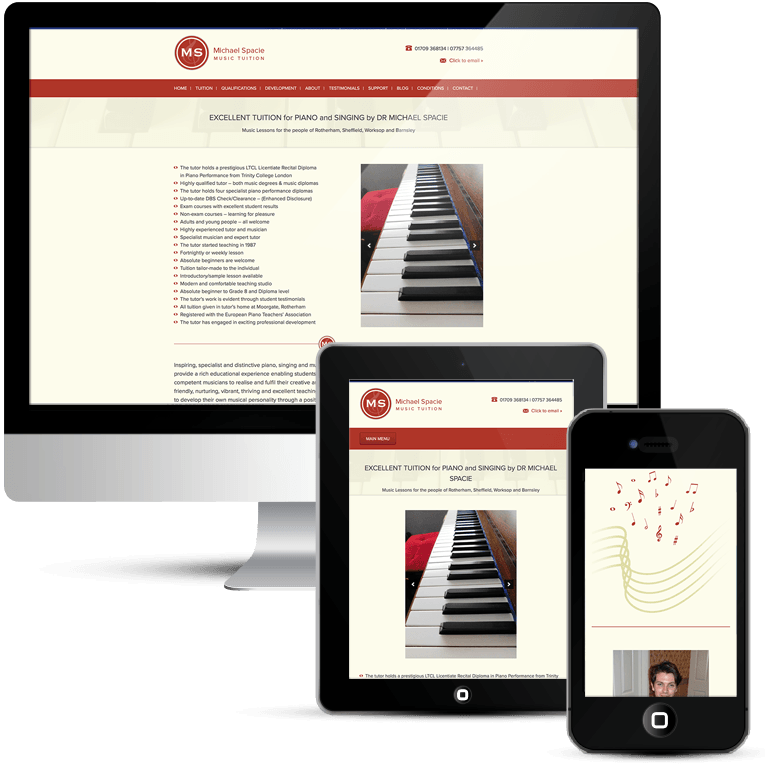 Michael had an existing website and as above, wanted to retain the red and cream as the main colours for this new website design. The logo is a new design also done by me, the circular icon includes a musical note to stay with the music tuition theme. The website has a lot of text, so I had to make sure that there was plenty of space for this in the website design. Images are interspersed to break up the text a little. 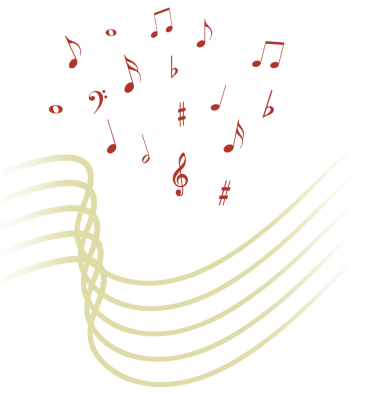 I designed the musical notes graphic for the home page to add some interest to the page. Buttons and image links were custom designed to match the theme. The website does very well on Google, with a page one position for music tuition in the local area. This is a mobile responsive website design, so works on all devices no matter what screen size. I chose Proxima for the font, which I felt was a bit more contemporary than the original Verdana.